The Pan / Gain button on the top of the main view toggles the track faders between Pan Control Mode and Gain Control Mode. The faders are calibrated in dB to give you plenty of room to play with. Be careful when banging the limits of the faders as this could lead to distortion of the output signal. 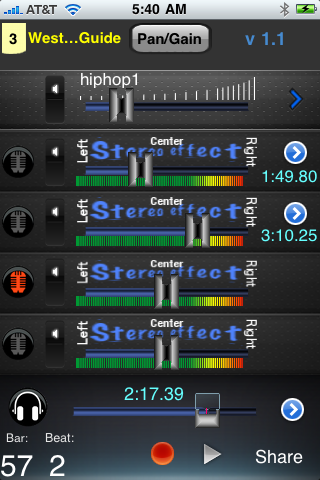 Gain Mode lets you adjust the output gain (volume) of each track. The same gain setting is used for playback and mixdown. 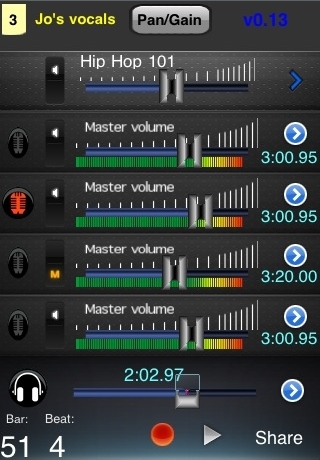 The gain control is not used for input (recording). The gain control is calibrated so that when it is at the top of the green region it is at 0dB (unity gain). Moving it out of the green region can result in over-amplification and distortion. The gain control is calibrated in dB, so the position of the fader relative to the loudness of output is linear.